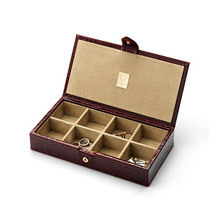 Aspinal of London's Leather Cufflink and Watch Boxes are deserving of your most prized accessories and handcrafted to the highest standards by our own master craftsmen. 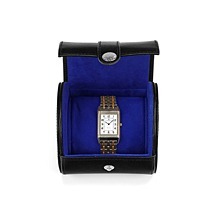 Our Small Stud Box and Travel Watch Roll are ideally sized for slipping into a suitcase, while our multi-compartment Cufflink and Four Watch Boxes offer a stylish spot to store your treasured pieces at home. 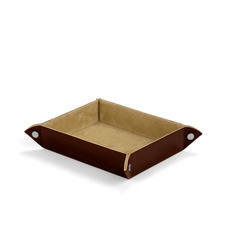 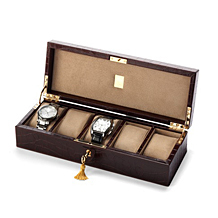 Carefully stitched premium leather is enhanced by suede-lined, cushioned interiors and solid brass hinges and fastenings. 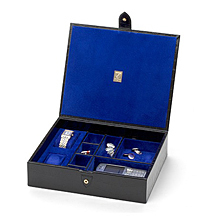 Each Aspinal leather dressing case, cufflink box and luxury watch box is individually handcrafted by our master craftsmen using only the highest quality premium leathers, the softest suede lining and solid brass fittings and locks. 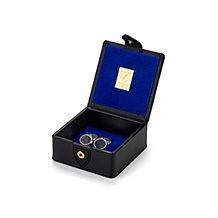 Available in a variety of sizes all of our leather cufflinks boxes and watch cases will enhance any dressing table and proudly delight you every time it is opened. 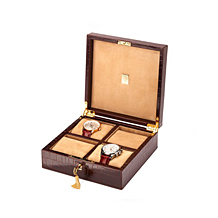 The exquisite Aspinal range of leather dressing cases, cufflinks boxes and luxury leather watch boxes for men can be personalised with initials for that extra special personal touch.